Seventy six km out of Prague and through the Czech country side. High mountains (Snezka on Polish border?) just visible far off to the North through haze although the sky above is brilliant blue. Gentle breezes and a little cooler than recent days. Traffic on road is heavier than we’d like but there didn’t seem to be a choice and the Czech drivers are passing with plenty of room. Nice cycling weather but I’m going slowly at the moment – too much Czech beer perhaps – or too little. How to know? It doesn’t really matter as the Czech therapy is the same either way – more Czech beer! 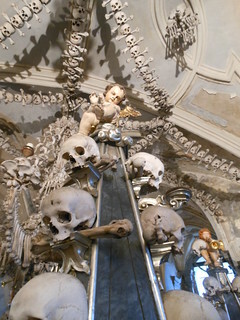 Visited the Ossuary at Kutna Hora – seriously bizarre, thought of Michael Palin’s visit (definitely his sort of place) and then the Mentals’ song Spirit Got Lost. I’ll let a photo do the talking. Prague – Kutna Hora by ianwroberts at Garmin Connect – Details. This entry was posted on 8 July 2012 at 4:14 pm and is filed under Czech Republic, Europe 2012. You can follow any responses to this entry through the RSS 2.0 feed. You can leave a response, or trackback from your own site.